The eyes are smaller, so different approaches are called for. Advances in vitreoretinal surgery over the past decade have included small-gauge entry systems, refined instrumentation, widefield viewing, and intraoperative OCT imaging systems. All of these advances have benefitted retinal surgery in adults, but they are also beneficial in pediatric retinal surgery. • Small eye size and proportional differences in pediatric ocular anatomy warrant special surgical considerations. 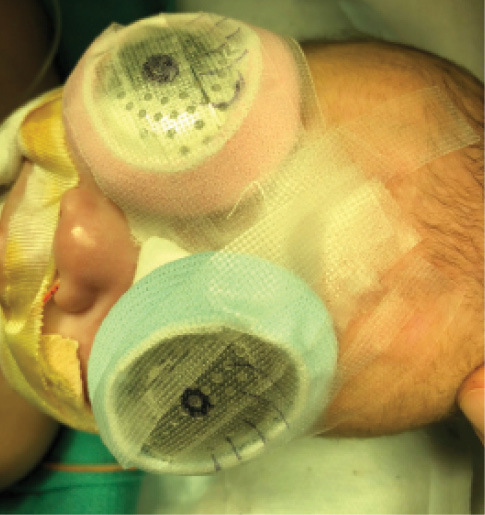 • Small-gauge instrumentation is beneficial in the tight confines of the pediatric eye. • Working with professionals in other disciplines postoperatively can help to ensure good visual rehabilitation. The term pediatric comprises a wide age range, from birth to 18 years. There are far fewer indications for retinal surgery in this age group than in adults. Indications in the newborn include congenital causes and tractional retinal detachments related to retinopathy of prematurity (ROP), persistent fetal vasculature, or familial exudative vitreoretinopathy. With increasing age, trauma becomes another etiologic factor. There are special considerations—preoperative, intraoperative, and postoperative—for surgery in a pediatric eye. The proportions of the pediatric eye are different from those of the adult eye, with a shorter axial length and a larger lens relative to the size of the globe. There are more adherent vitreoretinal attachments, and the eye may be affected by congenital anatomic abnormalities. 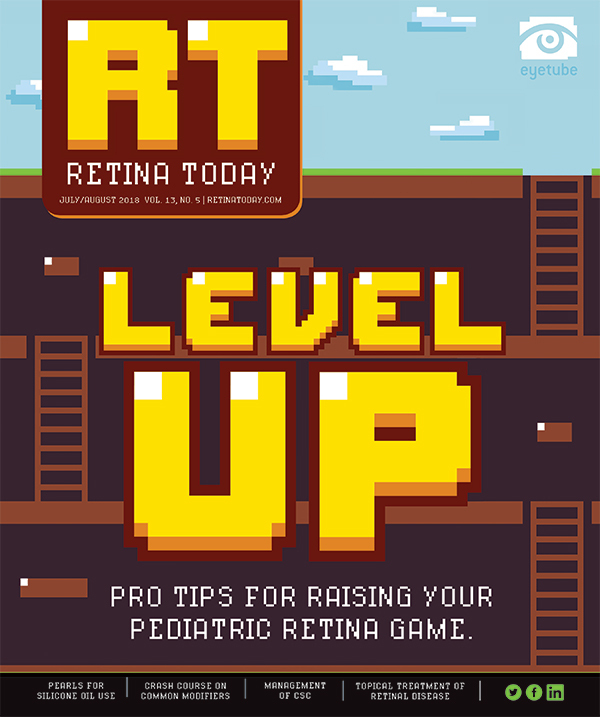 In this article we offer some tips for performing successful pediatric retinal surgery. Having a discussion with the patient’s parent or parents is probably the most important factor to address in the preoperative period. The parents must have realistic expectations, not only regarding their child’s postoperative visual potential but also the possibility that more than one surgery will be needed. Furthermore, if the child is in the amblyopic age range, the caregiver or caregivers should understand the potential for refractive issues, such as the need for patching, contact lens wear, and refraction changes. If examination and imaging in the office are not possible, there should be a low threshold for examination under anesthesia. 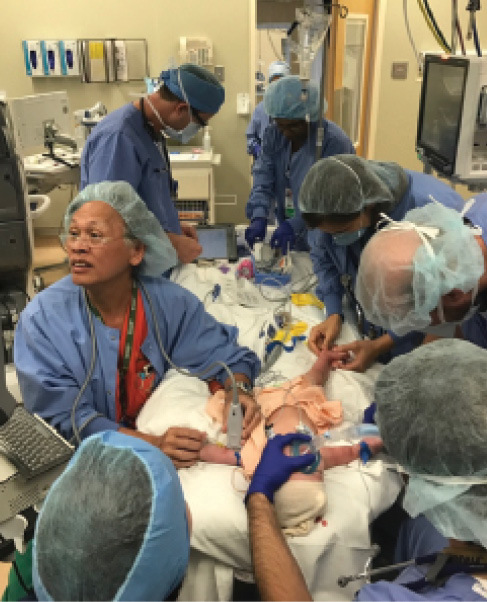 For pediatric patients, it is imperative to have a well-trained anesthesia team prepared to manage children of any age and to address any issues the child may have (Figure 1). Figure 1. A well-trained anesthesia team should be prepared to handle complications that arise in patients of any age. Figure 2. Access to imaging equipment including ultrasonography, fluorescein angiography, OCT, and color fundus photography, is useful for diagnosis and documentation. Imaging technology that should be available includes ultrasonography, fluorescein angiography, OCT, and color fundus photography (Figure 2). All of these tests are useful for diagnosis and documentation. On many occasions the findings on examination under anesthesia can alter the surgical plan, and parents need to know this ahead of time. Once a decision to proceed with surgery is made, consideration of the following factors becomes important. Figure 3. Bilateral surgery on the same day may be considered in certain situations. Figure 4. A child’s two eyes are patched after bilateral surgery. In selected pediatric patients and in certain conditions, bilateral same-day surgery may be considered (Figures 3 and 4). Bilateral eye surgery is typically reserved for those who cannot tolerate two anesthesia procedures performed sequentially or who cannot have two separate surgical episodes for some reason, whether due to location, financial status, urgency, or visual development. These cases are performed as two distinct, separate procedures on the same day. 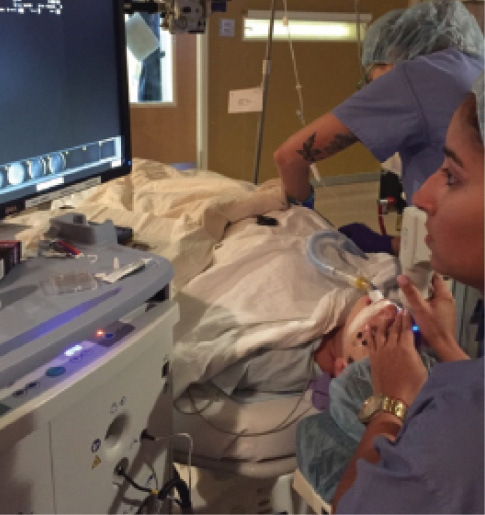 Trocar placement is important in any surgical procedure, but it is even more important in pediatric retina surgery. The size of the patient’s eye and the type of pathology will determine the need for trocars. A combination of none, some, or all ports may be used. Always examine the eye using indirect ophthalmoscopy to ensure that there is no aberrant retinal tissue present in the region before placing the trocars. For very small eyes, the use of a small diameter nondisposable BIOM lens is helpful. With the Resight Fundus Viewing System (Carl Zeiss Meditec), the lens must be taped to the handle in order to use it. With small eyes, there is no better way of moving inside the eye in such a small, tight place. For very small eyes, a 25-gauge vitrectomy system is adequate. An even smaller gauge, a short 27-gauge vitrectomy system, is on the horizon, and this may be especially useful for small eyes. Ideally, we prefer to leave children phakic for refractive purposes as well as for improved tamponade when oil or gas is used. However, the choice of whether to remove the lens or not generally depends on the location of the retinal pathology. If the pathology is located anteriorly and cannot be addressed without affecting the lens, then the lens should be removed. If the lens is to be removed, some or all of the trocars can be placed at the limbus, thereby minimizing trocar manipulation of the pars plana anatomy, which may be congenitally abnormal. Stain, stain, stain! Use of an intraocular adjuvant, whether in the form of Triesence (triamcinolone acetonide injectable suspension 40 mg/mL, Alcon) or off-label Kenalog (triamcinolone acetonide injectable suspension, Bristol-Myers Squibb), can greatly assist in visualization of the posterior hyaloid. 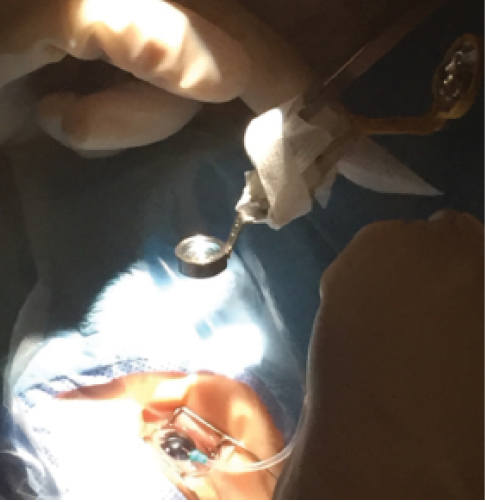 Some surgeons like to use the Finesse Flex Loop (Grieshaber/Alcon) to remove adherent hyaloid, starting radially at the nerve with the magnifying lens. If it cannot be removed entirely, then it may be better to fill the eye with silicone oil and return for surgery at a later time when separation of the hyaloid will be easier. Never have we regretted placing a scleral buckle. Rather, we have regretted not using a buckle. Consider a primary scleral buckle or a scleral buckle combined with vitrectomy for peripheral tractional and myopic retinal detachments, as well as for trauma. The use of intraocular gas is ideal, but this may not be feasible due to the patient’s age, concerns about lack of compliance with positioning, or the inability to remove all of the hyaloid. Postoperatively, it is helpful to work with colleagues in other disciplines or subspecialties to ensure patients’ visual rehabilitation. A good optometrist can help with infant contact lens fittings, and a pediatric ophthalmologist can consult on prevention of amblyopia and managing other refractive issues. Alternating visits with these other professionals is a good practice to ensure broad coverage of any potential issues.